We snagged this bird photo as we ate lunch while hiking on the cliffs at Yosemite National Park. This jay was closely watching us and was pretty fearless as we could get within 2-3 feet of him in order to take the picture. Steller's Jay Photo From TheRagens.com. Picture taken in August 2002. If you want to reuse our pictures, please review our usage policy. The Steller’s Jay is common throughout the Western portion of the US where it can primarily be found in the coniferous forests of the West as well as the Douglas Fir forests of Wyoming and Montana. This jay is especially common in California, Arizona, New Mexico, Utah, and Colorado but is absent from desert areas and the Great Basin. 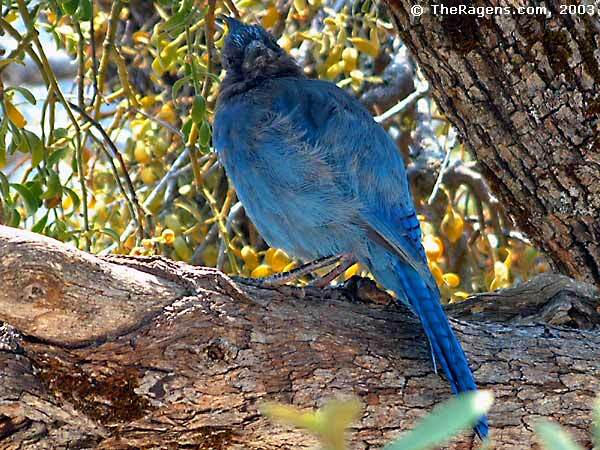 On the West Coast, Steller’s Jays may range from sea level to tree line, but within the continent they generally range in altitude from 3,000 feet to 10,000 feet. Like other jays, the Steller's Jay consumes a wide variety of foods, including small vertebrates and arthropods, seeds, berries, nuts, and especially acorns and pine seeds when available. They commonly take the eggs and nestlings of small birds, and they have even been observed attacking and eating adult birds. Normally a shy and wary bird that feeds mostly in treetops, the Steller’s Jay can become accustomed to humans at campgrounds and picnic areas like where we met ours. Additional details can be found via Cornell's Ornithology Lab.